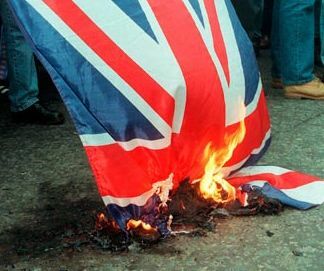 You may find this picture somehow in no way connected to the West Coast rail bid fiasco, LIBOR rigging, illegal wars and so on, ad infinitum. It is very much linked to human greed and corruption. This horrific, yet frequent, outcome of persecution, fuelled by hubristic greed is how such evil selfishness ends. The British once had a Civil Service and Parliamentary bond that ensured respect for honesty and decency. Most scandals involved MPs, not their Sir Humphreys. However, just as Labour elected and less than wealthy MPs envied their richer and better connected opposite numbers and wished to ape them, so with Civil Servants. The honest and reasonably well rewarded Cabinet Secretaries and their department senior colleagues began to envy the richer entrepreneurs they now found themselves working with. Life time dedication to principles, honesty and fairness began to pall. The honours list graduation no longer what it was, as the likes of Prescott and others devalued that area of elitist comfort. To add further to the misery heaped on hapless and trapped intellects, the likes of Alastair Campbell were drafted in to ride roughshod over once proud and incorruptible officials. Their way of behaviour trampled under and beaten down by Bliar's dossier fiddler. A man soon to nepotistically enter what's left of our discredited and corrupt Parliament. Who says crime doesn't pay. The unholy mess we now wallow in, in Western Society, is as corrupt or worse than anything that ever comes out of Africa. The political machinery is well and truly the engine for bankers, corporations and gangsters to drive us all to extinction. Those piled up corpses above will one day grace all the major cities of the world. Not just African deserts and wastelands. The West Coast bidding war has highlighted how endemic and systemic the roots of lust for power and greed for the top places, at a dubious banquet table, go. That idiot, Wallace Red Ed trumpets "one nation" before a Union Jack inspired, plagiarised emblem, nicked from the Tories in 2010. Still didn't let him reveal this morning how very rich politics have made his family. That last point is most relevant. Career politics is now a passport to riches the Private Sector have to compete far more significantly to achieve. First the politicians climbed aboard the tax payer funded gravy train. Then the trade union bosses jumped on as it left the station called Decency Stop. Now rapidly, in less that two decades, The Sir Humphreys have bought tickets. Again, not on merit and value to us as "servants" but as lewd, resentful, churlish chancers. As soldiers are sacked, deals to replace them with foreign troops are done. Top jobs under the EU banner are bartered in return for favours employed, to water down and wash out any Nationalistic pride and belief in a fairer nation. A pattern is now emerging. If you wish to clamber to the top of this despicable, rancid pile, you have to sacrifice any sense of loyalty to truth and honesty. As the West Coast scandal will be hushed up, the EADS/BAE one will fester away. Here the money involved is breathtaking. The kickbacks will be eye wateringly fantastic. The once proud and select Civil Service will now demand their cut and their blood monies. Most of which will be siphoned off from what really should go to tax payers. We used to wonder where all the money goes. Now we know and still are helpless to do anything about it. That is unless we voted somebody other than the present lot into office. No chance, of course. Elections and referenda are as corrupt and rigged as everything else. They say power corrupts. No one ever realised how much. Only a visit to a place such as above can tell us. Not too long before we can all see such awful scenes. or be one of the corpses. If you think that's far fetched have a read of Hitler's rise to power and remember how history always repeats itself. Uncanny similarities.